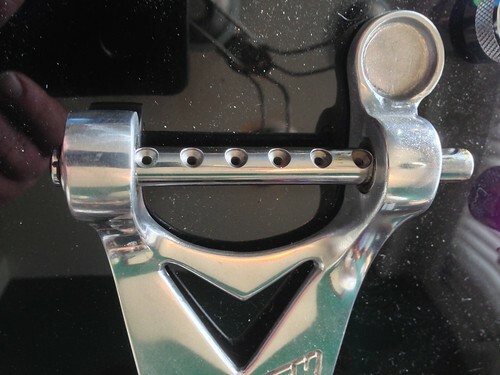 A few weeks back, Norm made a post (see viewtopic.php?f=4&t=2916 )n the Announcements section that said that a company was now making a replacement string bar for Bigsby units that was drilled for the string instead of being pinned. 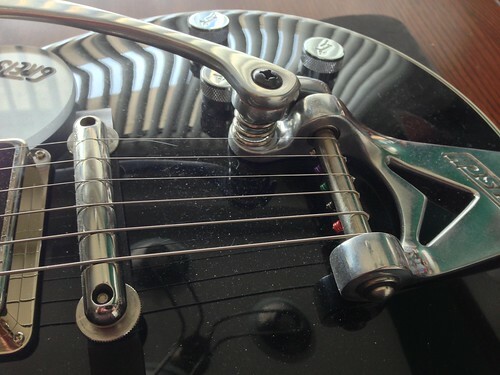 This was something that Paul Yandell had done to at least one of his guitars, as well as Norm, and a few other builders (Tom Anderson has been doing it on his guitars since the mid 2000's ). 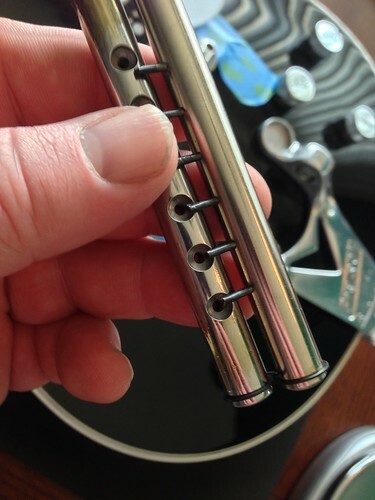 Anyway, I like things that make my life easier....as well as like to tinker with things, so I placed and order with Callaham, and received the part yesterday. 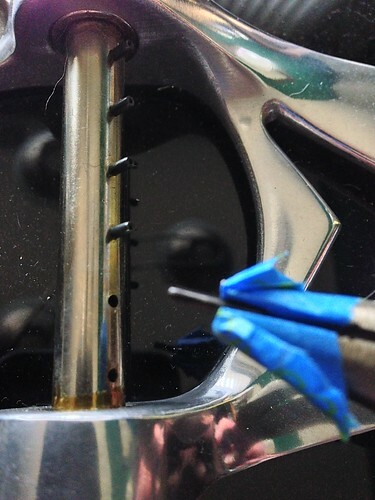 This morning I did the procedure on one of my guitars. I took some photos, and thought I would share. 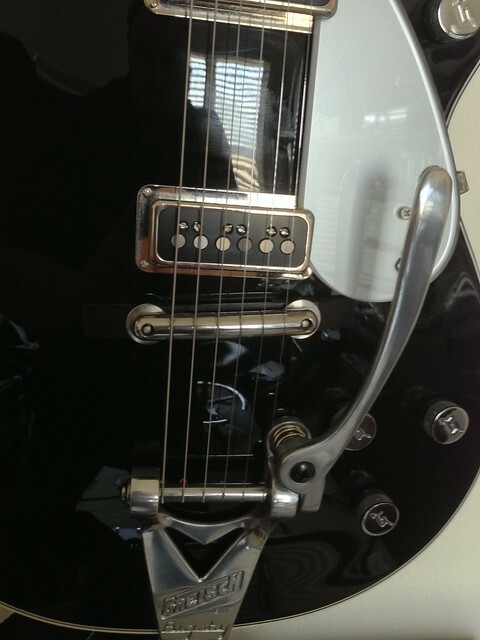 I currently have two Gretschs....a George Harrison Duo Jet, and a 6120-CGP. I decided to go with the Duo Jet first only because it was out. 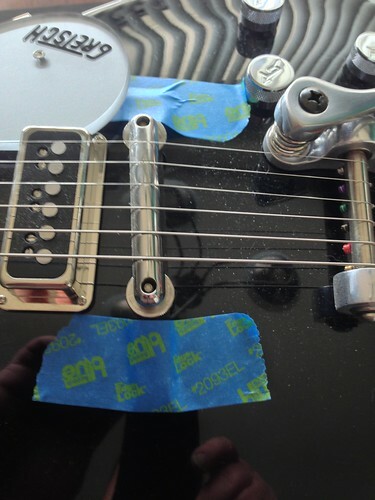 I taped the bridge down with blue painters tape, so I wouldn't have to fuss too much with resetting the intonation. I took the strings off, and removed the handle/bracket. I then used a pair of needle nose pliers (I wrapped the ends in tape to keep the teeth from chewing up the pins). 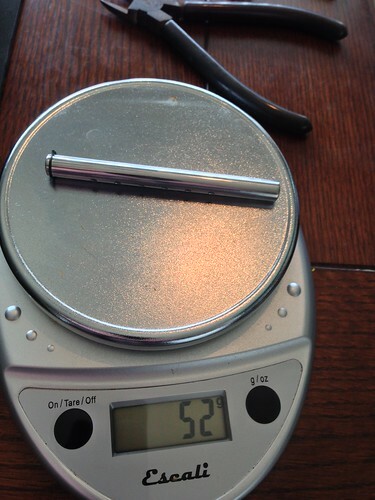 The pins came out fairly easy, pulling straight out with a little twisting. 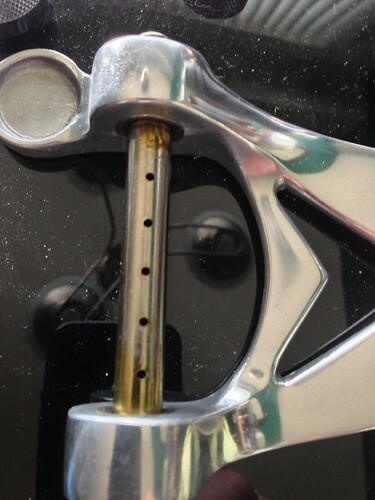 After the pins were out, the bar can slide out freely. 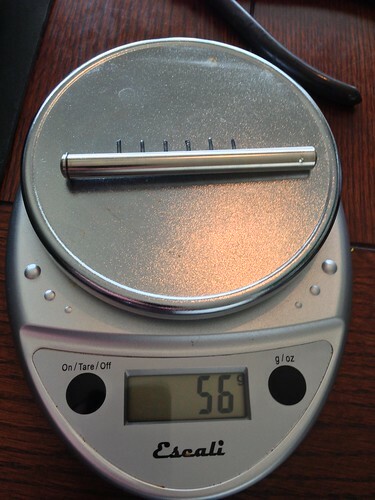 Just for informational purpose, I put the both the old string bar with pins, and the new drilled Callaham string bar on a gram kitchen scale so you could see what they weigh. The Callaham weighed less. No big surprise here, as it has holes drilled in it. While comparing the two bars side by side, I noticed that the Callaham unit was drilled out with slightly wider spacing. 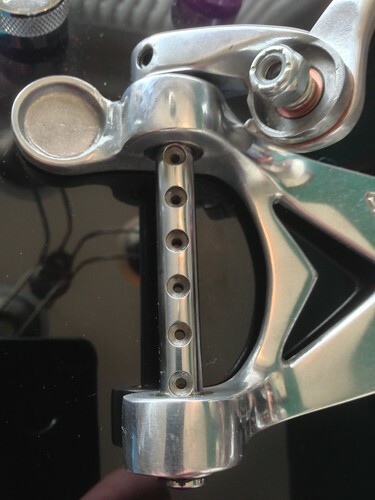 In the photo below, the pin on the bottom is aligned with the center of the drilled hole on the Callaham unit. You can see how much of a difference there is when it gets to the top pin in comparison to the top drilled hole. 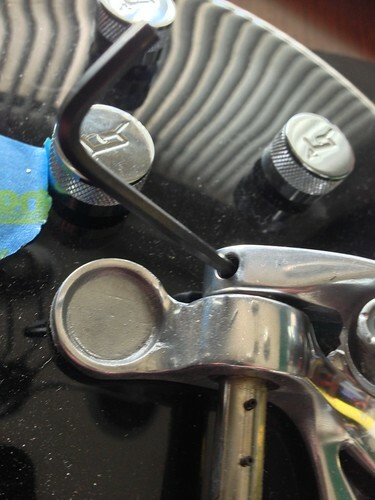 At first I was worried about this, but it fit in the Bigsby body, and lined up perfectly. Time to clean the guitar and string up. 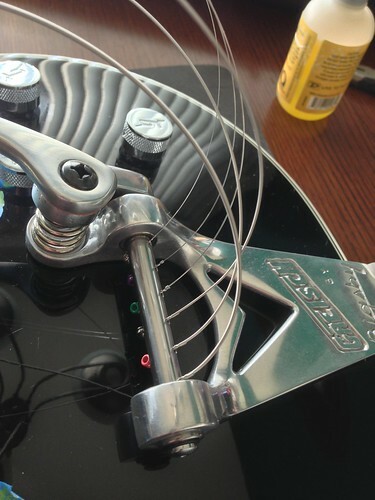 Stringing the bar was a breeze, though you need to slightly raise the bar to feed the strings through. And with the strings tensioned up. Notice the red ball end visible in this pic? I didn't when I took it. It was not fully seated. I had to loosen the string and pull it all the way through. 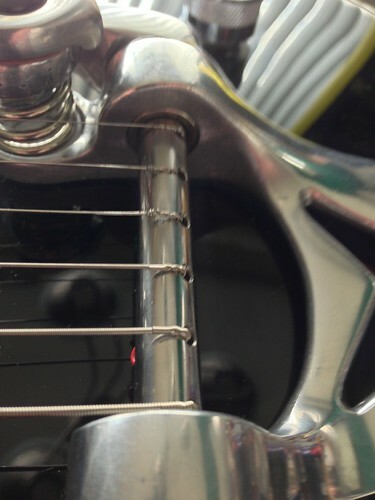 I will remember to watch that the next time I change strings. All done. After getting it all put together, the unit works as it should. 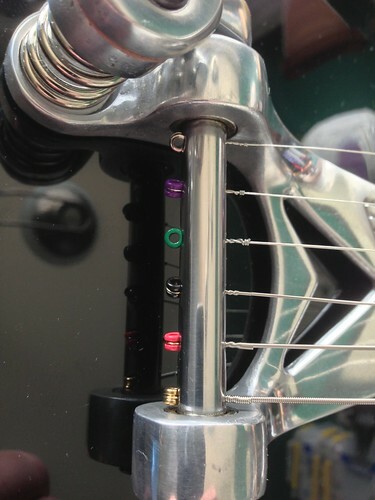 The wider spacing of the drilling actually results in a straighter string path from the bridge to the string bar, and is not angled on the outside strings like on my stock pinned units. Anyway, $40 from Callaham. You have to call them up to place an order, as they have no way to order online. I ordered last Friday, and received it a week later. The send via USPS, and require a signature. I am happy with my purchase. Good company, good product, and does what it is advertised to do. I wish some of the big electronics companies would hire George to design and compose their "Owner's Manual's! Sure simplifies things when the instructions are not only well thought out and presented, but as a bonus, they're even in understandable English!